Home > VoIP Support FAQ > VoIP > How Can I Create a Basic Call Queue? How Can I Create a Basic Call Queue? 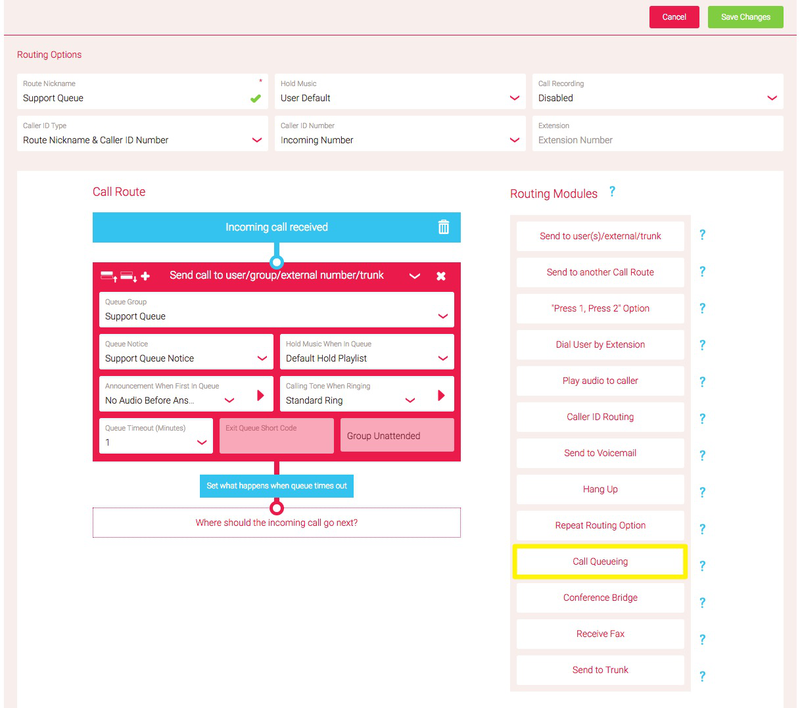 Creating a Call Route for Call Queues is nice and simple - we have a module specifically designed for it! If you've never created a call route before, I suggest you have a read through our FAQ on What is a call route and how do I use it? To completely set up your new Call Queue, you'll need to have gone through a few other stages first - such as setting up a Call Queue Group and a Call Queue Notice. Once you've created these, you'll just need to assign them in the Call Routing Module! Once you've got to Call Routes and add a Call Route, on the right-hand side you'll see a module named "Call Queueing". Select this option, and a box will appear in the middle. In here, you can assign the Call Queue Group and the Queue Notices you created previously, as well as the Hold Music you'd like to play while the customer is in the Queue, you can play an announcement when someone reaches first in the Queue (You can upload a custom Audio File in the Audio Section) and even choose the Calling Tone when the customer starts ringing through to your Users! Queue Timeout - This will determine how long you would like the customer to be in the Queue for - you have the options of 1, 2, 3, 5 and 10 minutes, as well as being able to disable this options completely. You can then choose what you would like them to do - such as a leave a voicemail, or play a message to call back another time. Exit Queue Short Code - This enables you to create a shortcode that you can either keep internally or give to certain clients, that when they dial will exit the Call Queue, and here you can dictate where you'd like them to go. Group Unattended - This would only occur when all the users are unavailable, such as if they had dialled a shortcode to set themselves as unavailable, or a loss of connection to our service meant the calls couldn't be answered, and you can choose what you would like to happen in those events. Once you've saved and assigned your Call Route to a number, you'll be ready to go! If you have any issues once the call queue has been created, please have a look through our FAQ on Troubleshooting Call Queue Issues!